Green juices are a trend now and the benefits they offer guarantee they will be around us for a long time. They can help you look and feel better with the minimum effort. When you get the best juicer for greens you can obtain the most powerful nutrients to boost your metabolism, lose weight and improve your digestive system. Although every juice extractor available in the market can provide you green juice, only the top juicers can guarantee that you obtain all the vitamins and nutrients from leafy greens. Greens have particular features that need to be taken into account when they are processed. They also need their own way to be squeezed. We took all these features into consideration and selected the top 5 options that can be called as the best juicers for greens (including leafy). 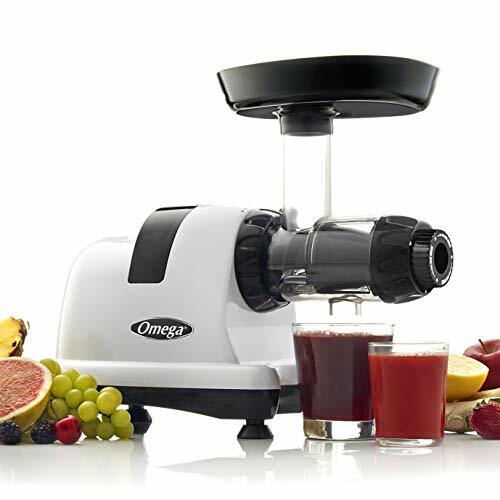 Among them, the Omega J8006HDS Nutrition Center stands out as the best overall for offering a complete set of functions as a juice machine. Check the whole list of the best juicer for greens we prepared for you and be confident that any of them are a great choice. This is the best masticating juicer for greens. It can process small and large amounts of greens and allow you make juices only for yourself or the whole family without falling. It is a juicer for hard vegetables but also a very effective tool to process pasta, grind coffee and squeeze fruits. The model is easy to assemble, durable and fully stable over its 4 feet. The Omega J8006 uses a low speed of 80 RPM to get the most of the greens with the minimum heat. It guarantees the maximum extraction of nutrients and the minimum oxidation of enzymes. It is also powerful enough to process pasta, coffee, nuts, herbs, and fruits to create the most delicious creams, baby foods, and frozen desserts. But there are other models to choose from and they are all a great option to consider too. Besides being the best vertical juice extractor, it is also one with the lowest RPM by having only 47. It guarantees hard work to obtain all the nutrients and enzymes of the leafy greens without affecting their composition. The design and the vibrant colors are perfect to match modern kitchens (as it’s available in 2 colors you can match it with the tones of your décor). This juicer is easy to assemble and easy to clean with the help of the plastic brush (included). It is also easy to operate and you can even control the juicy flow into the container or close the cap to allow the juice to mix inside. Its high-quality is confirmed by the 10 years manufacturer´s warranty. 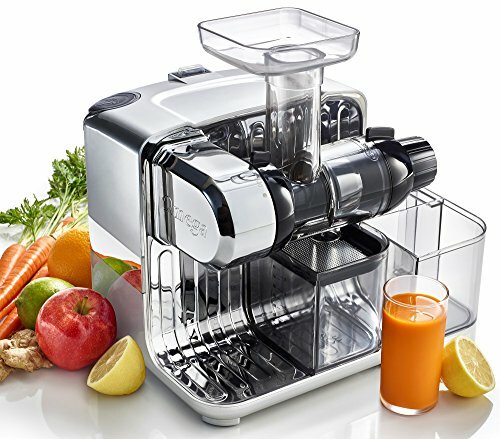 Manual juicers were rapidly substituted by electric juicers, but some of them – like this model Lexen GP27 – are still on the run. It is a masticating juicer that guarantees the best extraction and it is easy to clean and operate. This is also the best inexpensive juicer for greens. It doesn’t matter how much pressure you put to operate it, it is resistant and durable, so you can use it as a juicer for hard vegetables. GP27 is a great option for beginners, because you can use a low budget to discover what you should expect from a more professional juicer for greens. It is easy to assemble, easy to use and easy to clean due to its simplicity. The wide feed chute allows you to save time and effort as you don’t have to worry about cutting little pieces to fit the juicer. Another feature is the maximum stability of the suction and table clamp mechanisms. The only downside is that the pulp left after the juicing is so dry that it requires a little effort to clean it up. The thoughtful design of this juicer makes it efficient. It doesn’t take too much space in your kitchen, but when you open it you can find all the parts and accessories you need. The back storage allows to keep it compact when you close it and is perfect to store components and accessories. Its pulp ejector guarantees that you will not have clogging while operating. The Cube 300S has 3 adjustable settings that may vary according to the type of fruit or veggie that you add. The wide feed chute and wide throat allow you to put big pieces of greens and fruits. It is very easy to clean, the cleaning brush is included and has its own space where it can be stored. Whenever you have doubts or problems you can rely on a very efficient customer support from Omega’s team. This juicer machine is able to maximize the juice yield with up to 80% extraction. How? It is a low rotation juicer of 80RPM complemented with a 3-stage spiral warm that preserves enzymes and minerals. It includes a full set of parts and accessories with a free e-book for some of the best recipes for green juices. Mooka is easy to use and clean and includes separate pulp cup and juice cup. Perfect for beginners and experienced juicers too that make it a champion in many juicer reviews. The quiet motor with less than 60 decibels allows you to make juice at any time of the day without disturbing neighbors or family. It includes all the necessary accessories such as juice cup, pulp cup, and cleaning brush to facilitate the cleaning process. The Twin soft/hard juicing program with reverse function allows you to juice fruits, veggies, and leafy greens easily. The auger with a 3 stage spiral warm can chop, squeeze and micro squeeze until it gets all the nutrients. Whenever you decide to opt for the best juicer for greens, you will be probably entering into a whole new world. This is because there are many models available in the market and their functions, sizes, and designs vary from one fabricant to another. But you don’t have to worry. In spite of this, once you understand the basic features of a juice maker you will be able to select the best option for your budget, your kitchen and, ultimately, your green juice. Keep reading to find them all. 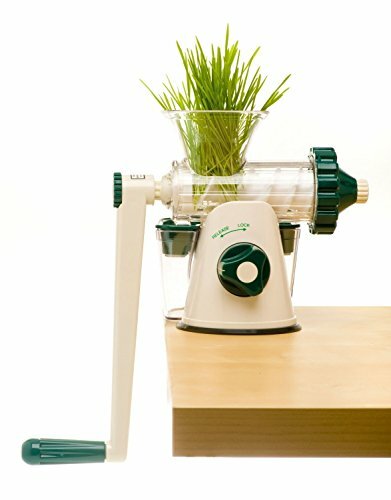 What type of juice extractor is the best for making green juices? There are 3 main types of juice extractors that can make you doubt about which is the best option for leafy greens: centrifugal, triturating and masticating. Centrifugal and triturating models can be very efficient in terms of the amount of juice they extract. However, when it comes to greens, it is not the most important factor. What you really need to consider is how much of that juice gives you the benefits you are looking for. When a juicer machine starts working, it uses power and energy to complete the task and it can add heat to the process. It eliminates nutrients and enzymes as well as shortens the time that the juice retains its nutritional properties. In this sense, masticating juicers have proven to be the most efficient juicer for greens. This is because they are able to extract more nutrients from the greens and you can notice it by the pulp that is left after the process. They do not produce heat and most of the enzymes and other features remain intact. A masticating juicer is also good for hard vegetables, such as celery, and other hard to extract such as wheatgrass. When checking the motor of a masticating juicer you will realize that most of them are among the range of 150 – 250 W. That is good news because this kind of power is enough to get the best results. However, it would be more important to verify the Revolutions per Minute (RPM) it uses to perform. Is it a high-speed or low-speed model? When you consider buying the best juicer for greens, a low-speed would do a better job. It avoids heating the greens and the low speed allows the juice extractor to take the necessary time to squeeze all the nutrients and enzymes from the greens. 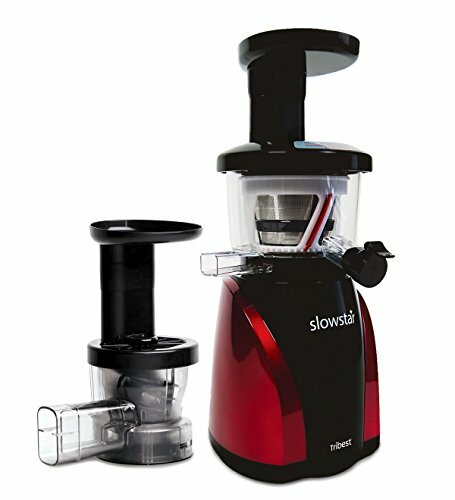 The best slow juicer is usually below the 100 RPM range and many of them are in the range of 80 RPM. If you go lower than that you must consider that it may take longer to get your juice, but you may also get a better product. Fortunately, both options have plenty of advantages and whichever you choose, they will give you an excellent green juice. The differences may rely mostly on your lifestyle and your type of kitchen. If you have a little space available, a vertical model is definitively the best choice. It may also match a busier lifestyle as the feed chute is usually bigger and allows you to add more greens at the same time to speed the process. Verticals are also easier to clean as the position push the pulp down while processing the greens. They come in different colors and designs and are a fantastic choice for beginners. If you already are an experienced juicer perhaps you should opt for a horizontal model. They are usually more powerful and have more functions to prepare baby food, creams, and grind coffee. The extra time you take to clean them and the additional space they take in your kitchen might be worthy. Deciding between vertical and horizontal is also an excellent opportunity to check the best design that matches your kitchen decoration. Multipurpose or only for greens? The best juicer for greens doesn’t necessarily include options to prepare other foods. However, some fabricants understand that buyers are always trying to maximize their purchases. Some juicer machines are already adding new features to help them do so. Horizontal masticating juicers are among the most popular. 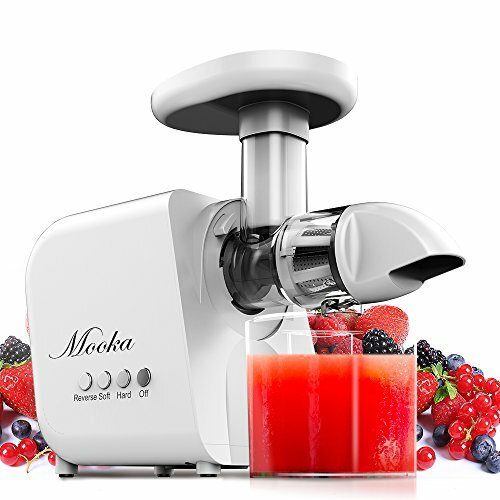 In this list, our best pick Omega J8006HDS and the Mooka Juicer are great choices as you get qualitative juicer for leafy greens while having the option to prepare other combinations for desserts, baby foods or grind coffee among others. The price of a juicer extractor is usually in the range of $200 and $500. Higher prices are for the most sophisticated equipment and if you have the budget and experience as a juice maker, they are totally worthy. Lower prices imply that a juicer machine is manual or exclusively for greens. However, it doesn’t mean they are a bad quality item. You can see it in the Lexen GP27 set above, which is the manual model with a price under $100 and is the best inexpensive juicer for greens. It is easy to clean and operate and can make you awesome green juices. Many people also like to have separate appliances for every type of food they prepare. If this is your case you can opt for a low budget juicer for greens and complement the other recipes with another juicer, blender or extractor. Fabricants offer fantastic warranties for their juicer. The warranty for many masticating juicers starts with 10 years and sometimes it is extended up to 15 years. Be aware though that this warranty period is usually for the motor. Shorter periods such as 3 or 2 years of warranty are set for replacement parts. Many juicers are manufactured in very resistant materials such as stainless steel. Those that use other materials try to manufacture them with the best options available in the market. Parts may come in durable plastic or high-quality metal. Manufacturers offer extended warranties because they know they add some of the best materials to their products. Although you can choose among a wide range of features and designs of juicers for greens, it is also true that the best juicer for greens is in the range of masticating juicers. These are excellent news because this type of juicers can also work very well for other purposes. The wide range of models makes the selection easy according to your decoration and lifestyle. If you have been thinking about more healthier food habits, in my opinion juicer for greens is one of the best ways to start and you’re definitely on the right path. Instant Pot 8 vs 6 Quart (DUO80 vs DUO60) – What to choose?